Each evening I followed the same routine – alight the train, walk down the narrow passageway, cross the road, follow the pavement to a T junction, turn right, cross five roads, unlock the door to my house and enter. Then I began to notice plants growing in the cracks between paving stones and trailing over walls. The walls are a haven. Lime-rich mortar and sheltering crevices provide a home for insects, spiders, plants and ferns. Replicating fissured rocky crags, these are like a fragment of mountain in my coastal home. 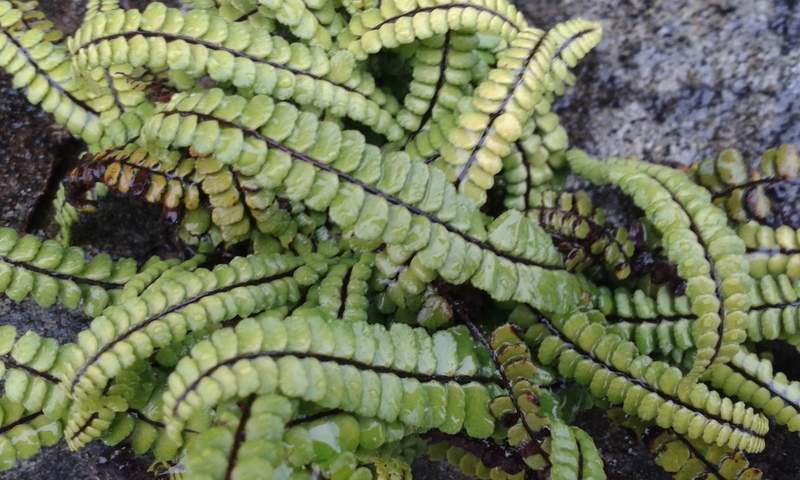 At first I recognised maidenhair spleenwort (ferns have wonderful names). The stiff, dark stems bear chains of beaded leaves forming tufts standing proud of the stony scalp. Then I notice wall rue, a less conspicuous dull green mat, and polypody, pale green ‘proper’ fern like leaves. Occasional miniature hart’s-tongue ferns add to the diversity. The identification of ferns is based on the careful assessment of detail, just as the appreciation of local wildlife is built on the observation of tiny elements which build to make my home. This entry was posted in SJ29. Bookmark the permalink.